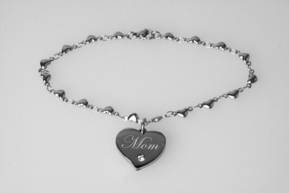 This silver heart charm bracelet can be engraved with your personal message. Show your commitment with this memento of love and adoration. Let your sweetheart know just how much you care about them. Fits Wrist Sizes: Up to 7.5"
Our custom engraved stainless steel I.D. bracelets are crafted with High Polish 316L Surgical Stainless Steel; the highest grade of stainless steel used in the jewelry market. It is fantastic at resisting fade, blemishes and rust. It is 100% resistant to corrosion. It will not fade, change color or leave stains on your body. It doesn't require any maintenance to keep it looking new!